▸ How do I know who to contact about a rule? Agencies can have rules that seem to overlap. An example would be rules about suicide prevention. There are many rules that cover suicide prevention in different ways, at different agencies. Rule R277-620-2 is written by the Board of Education to provide for collaboration with the Department of Health and Department of Human Services to establish, oversee, and provide model policies, programs for LEAs and training for parents about youth suicide prevention programs. Rule R156-60-105 is written by the Department of Commerce, Occupational and Professional Licensing for continuing education for Mental Health Professionals that dictates the requirements for them to complete suicide prevention training. Rule R523-14-2 is written by the Department of Human Services, Substance Abuse and Mental Health to implement a state suicide prevention strategy. Is the location a hospital? It could be written by the Department of Health. Is the location a school? It could be written by the Board of Education. Is the location a university? It could be written by the Utah Board of Regents. 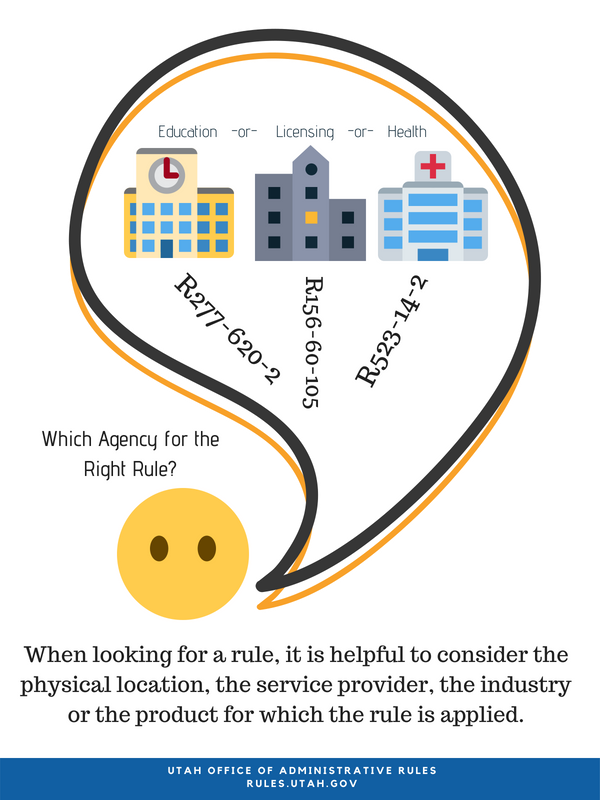 Defining the physical location of where a rule might be applied can be helpful when trying to find the agency that wrote a rule. For example, if the rule is in regards to an issue at a school, it might be the Utah State Board of Education that wrote the rule. However, if the school were the University of Utah, contacting the Utah State Board of Regents would be the correct agency to contact. By including simple words like ‘university’, ‘elementary’, or ‘secondary’, to your ‘school’ search, the results will be more likely to help you find the correct rule and agency. Defining the service provider of an issue surrounding a rule can be helpful when trying to find the agency that wrote a rule. For example, if the rule is in regards to a nursing professional (individual person), searching for ‘nurse’ would return results that cover nurse licensing through the Department of Commerce, Nurse Practice Act Rule. However, if the service provider is a nursing facility, searching for ‘nursing facility’ would return rules written by the Department of Health, Family Health and Preparedness, Licensing. In the example, when you include simple words like ‘licensing’, ‘testing’, or ‘facility’ to your ‘nurse’ search, the results will be more likely to help you find the correct rule and agency. Defining the industry of an issue surrounding a rule can be helpful when trying to find the agency that wrote a rule. For example, if the rule is in regards to a water company for your home water, the Public Service Commission writes rules for residential utility services (electric, gas, water and sewer). But, if the industry is drilling for a water well, the rule might be covered by the Department of Natural Resources, Water Rights. If you were to search for a rule regarding water, including simple words like ‘well’, ‘rates’, or ‘wastewater’ to your ‘water’ search will return results that will be more likely to help you find the correct rule and agency. Defining the product of an issue surrounding a rule can be helpful when trying to find the agency that wrote a rule. For example, if the product is in regards to selling homemade baked goods from home (home produced cottage foods) the rule would be written by the Department of Agriculture, Regulatory Services. However, if the product were a baked good produced at a business, the rule might be written by the Department of Health, Disease Control and Prevention, Food Service Sanitation. If you were to search for a rule regarding food production, including simple words like ‘home’, ‘safety’, or ‘restaurant’ to your ‘bread’ search will return results that will be more likely to help you find the correct rule and agency. Ready to contact an agency? Click here for the agency directory.